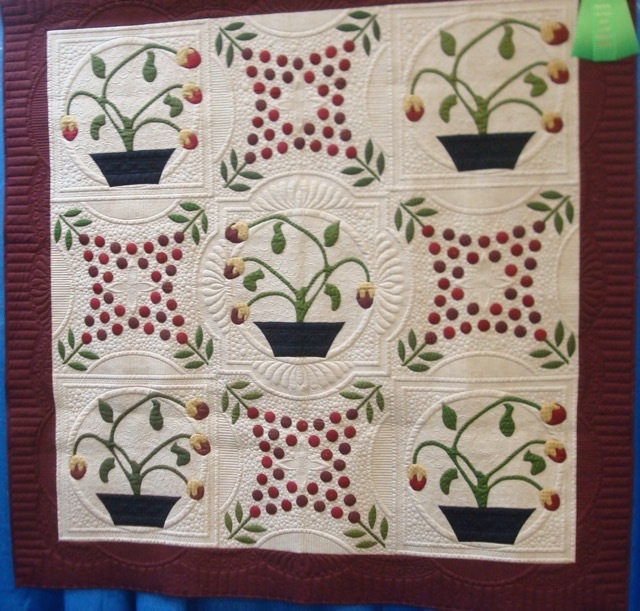 Last week I went to a quilt show: MQX. It stand for Machine Quilters Exposition, which, obviously, means that it’s focused on machine quilting. 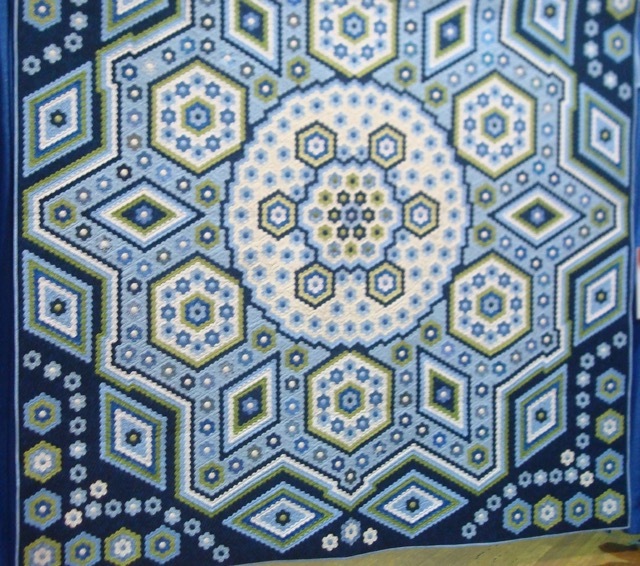 I would like to say that this fabulous whole cloth quilt is The Paisley Peacock by Bethanne Nemesh, but I focused on the quilt and not the label, so I’m not entirely sure. One of the reasons I go to shows like these is that I have a really hard time figuring how to quilt my tops. I try to forget comparing myself to the quilters in the show and just try to figure out what I like about the quilts, and what I don’t want to do with my own quilts. Then I try to apply what I’ve figured out to my own projects. This show, I came up with three questions to ask myself when I decide what to do about the quilting of a specific top. 1. How much time have I got? This is actually a two-fold question. The first “fold” is that the quilters at MQX have thousands of hours (probably tens of thousands of hours) experience in their craft. They know their machine. They know their fabric. They know their thread. I don’t have thousands of hours of experience. Well, at least not in the actual quilting part of it since for years I’ve been stopping just shy of that. I’m still just learning to use a long arm, to choose which patterns and which thread. The second “fold” is just how much time to I want to spend on this particular project. The truth is that the quilts I make are mostly intended to be used on a bed. Spending a year planning, programming and quilting just one quilt is not my idea of a fine ol’ time. It turns out that I don’t want to spend that much time on my quilts. While I love the look of very dense quilting when it’s used to enhance the block design (as shown in Way Too Many Circles), it’s something I usually decide against when I realize how long it would take to do and how much practice I would need to get ready to do something like that. La Passion by Grit Kovacs, quilted by Laurena McDermott is like my Spiro. 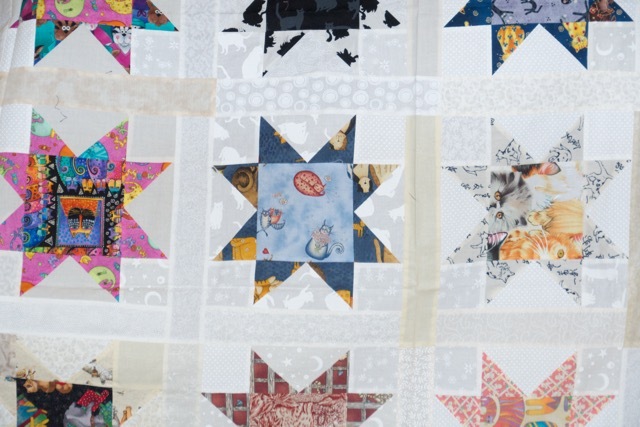 Sometimes, no matter how you quilt it, the piecing design will be the standout element. 2. How much will it show? 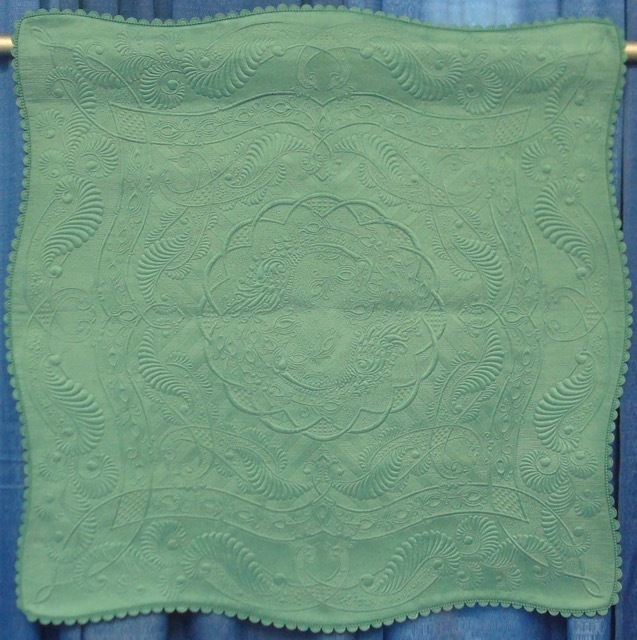 A whole cloth quilt (like The Paisley Peacock, above) shows the design of the quilting and allows it to shine. Ditto the quilting in the “space” between the appliqué in Way Too Many Circles. However, to make that sort of effort really wasn’t necessary in a quilt like Spirographology. It would simply have been lost, overlooked. I could have tried something a bit more , but, as I learned on the border of Got Dots, sometimes the effort just isn’t worth it. Yes, there are times I want to experiment, to learn more and gain more experience, but prepping for a quilt talk was not the time for me. I wanted to show some nice quilts. I really wanted to feature the piecing designs. I wanted to finish as many quilts as I could so I wouldn’t be just showing tops. Now that that is over, I can look at my projects with new eyes and decide if I want to be a little more experimental. Maybe some hand-guided quilting for DnA1. Maybe change-up the thread color or weight in another quilt. Who knows what else I’ll learn in the next year now that I feel like I’ve got the time and the motivation.